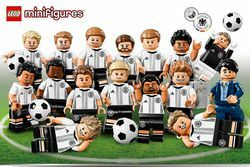 71014 DFB - The Mannschaft is a series of collectable minifigures released on May 14, 2016. The series is only available in parts of Europe. Celebrate the European Championship with this amazing minifigure collection, featuring the current World Cup Champions, Germany. Including Coach Joachim Löw, Goalkeeper Manuel Neuer; Defenders: Jérôme Boateng, Mats Hummels, Benedikt Höwedes, Shkodran Mustafi; Midfielders: Bastian Schweinsteiger (Captain), Mesut Özil, Thomas Müller, Toni Kroos, Sami Khedira, André Schürrle, Marco Reus, Christoph Kramer; and Forwards: Mario Götze and Max Kruse. Each player minifigure comes with the official adidasDFB soccer uniform bearing the player's name and number, plus a ball, display plate and a collector's leaflet! Who will you discover inside your next ‘mystery' bag? 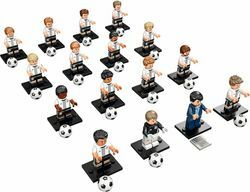 The LEGO® Minifigures, DFB – The Mannschaft collection features the German national football team, including the team coach and 15 players. Each minifigure in this series is dressed with the official adidas DFB soccer uniform bearing the player's name and number, plus a ball, display plate and collector's leaflet. Collect this unique LEGO® Minifigure series. PLEASE NOTE: Each ‘mystery' bag contains one of the 16 characters available in this collection. Unfortunately, we cannot accommodate requests for specific minifigures. If you purchase more than one ‘mystery' bag, you may receive two or more identical minifigures. Facts about "71014 DFB - The Mannschaft"